In 1241, a young trumpeter of Krakow, Poland perished as he upheld his vow to sound the trumpet every hour and succumbed to a Tartar's arrow. 220 years later, in 1461, the trumpet still sounds the Heynal day and night, but with a broken note that imitates how the young trumpeter sounded when the arrow pierced him all those years ago. The new trumpeter, Pan Andrew Charnetski, has come to Krakow to stay with relatives while he waits to deliver a valuable object to the king. When he learns that his relatives have been killed, Pan Andrew and his wife and son, Joseph must conceal their identities. Pan Andrew's role as the night trumpeter is meant to keep him out of harm's way but it is only a matter of time before his enemies catch up to him. Then it is 15-year-old Joseph who must come up with a plan to save his family and the new friends they have made. This is the first novel I have read set during the Middle Ages, that actually features a functional, traditional nuclear family. Family loyalty and honor is in fact one of the main themes of the book and one of the motivations behind Joseph's actions. The story as a whole is a struggle between good and evil, which favors humility, hard work, and honesty over pride, instant gratification, and deceit. It is also an exciting and dangerous adventure which is nearly impossible to put down once begun. Despite its age (87 years!) this book remains relevant because its themes are timeless and its story line is so compelling. As an educational tool, this book is also top notch. Because it is written in the third person, the narrator can take time now and then to provide historical context or to explain important political implications and religious beliefs. The story itself provides all the historical information needed to appreciate it, which is hugely helpful and appealing to middle grade readers. This book focuses on a very specific city in a very specific time, which could be a strike against its appeal to the masses, but the exhilarating high-stakes plot makes the history interesting in a way that so few children's books ever manage to accomplish. The Trumpeter of Krakow provides another perspective on the Middle Ages which balances out all the other England-centric titles available. It touches on topics such as alchemy that others do not discuss, and it gives readers a deeper appreciation for Polish culture. It could not be further from the type of book I typically gravitate toward, but I could not have enjoyed it more. It might be my favorite of the historical fiction books I've read so far this year, and it is definitely among my favorite Newbery books. The edition I read featured a series of intricate line drawings by Janina Domanska. These are certainly excellent in their own right, but they do fall a bit flat when compared with the original illustrations by Angela Pruszynska, which I was able to see thanks to inter-library loan. The original pictures include three full-color pages, one of which actually includes the music for the Heynal, and many other line drawings which depict the locations mentioned in the story. Certainly, it helps that the illustrator was from Krakow because she could easily draw from real life inspiration. 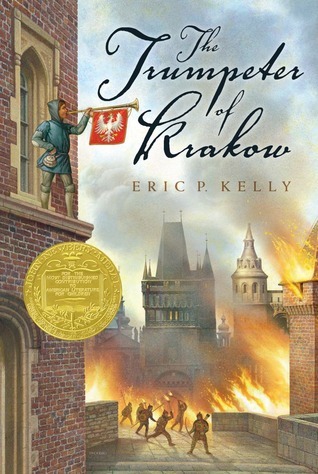 Unfortunately, she tragically disappeared during the Nazi invasion of Poland, and she only illustrated this and two other children's books, both stories of Polish history by Eric P. Kelly: The Blacksmith of Vilno and The Golden Star of Halich. Knowing this makes me want to especially encourage readers to seek out the original illustrations. The violence of the prologue scene where the trumpeter dies and the suspense of later scenes where the Charnetskis are in danger of losing their lives make this book most appropriate for middle school or even high school students. Polish history is not frequently high on the list of priority subjects to be taught, but for the chance to use this book alone I would highly recommend finding a way to work it into every curriculum. This sounds definitely old school, but also really interesting. I've never heard of it, but since literature that takes place in the middle ages is a real guilty pleasure of mine, I will be looking for this book. Thanks for sharing your review of it with us.